So, he thinks he’s man enough to take your precious daughter out, does he? Let’s see if he’s as ‘man’ as he THINKS he is. 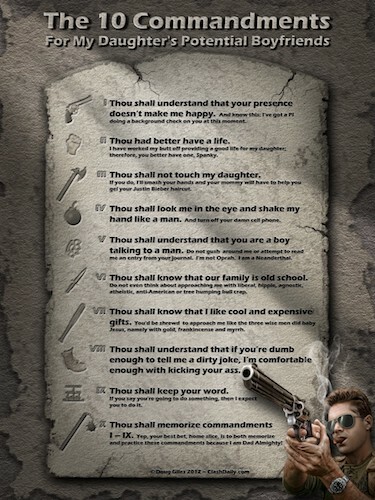 How well does he handle these 10 Commandments? Does he LOOK like he’s playing around? Of course not. We’re talking about our DAUGHTERS here. And men… we remember what WE were like in our teen years, don’t we? We’re not here to make it easy for some dopey walking hormone to take aim at our precious girls. Farmers use scarecrows to protect their fields, you can use this list to protect your daughter from dumb punks. It lays down expectations about respect, employment, integrity, honesty, and lays down a healthy dose of fear of consequences in the process. Let the potential boyfriend know the rules. This 24×32 poster for your home, office and man-cave comes with a FREE PDF download for your computer desktop! Share as a warning to anyone who dares to think they’re good enough for your daughter.